Christin started working for Dr. Good in 1996 as an assistant. She left in 1998 to pursue her interests in exotics (birds and reptiles). She recieved her licence in Veterinary Technology and graduated from Wayne County Community College / Wayne State University (WCCC/WSU) Technical Program in 1999. She returned to work with Dr. Good in 2000 and really enjoys her job and co-workers. Jessica started in the veterinary field as a kennel attendant in 1999 and then moved up to assistant. In the fall of 2001, she was accepted to the Wayne County Community College / Wayne State University (WCCC/WSU) Technical Program. She graduated in May of 2003 with an Associate Degree in Applied Science of Veterinary Technology and passed her Board exams to become licensed.  She has been at Dearborn Family Pet Care since May of 2002. She has 3 dogs and 1 cat at home. 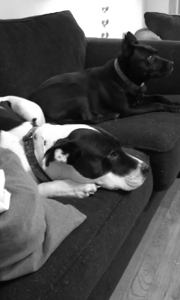 Payton (all black) and Daisy (black & white). 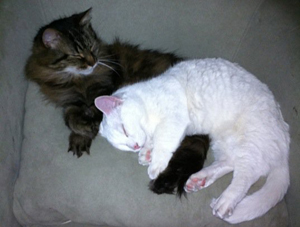 Diana has been in the veterinary field since 2003 and has been a Licensed Veterinary Technician since 2008. She has a Chihuahua mix named Evita and a Pug named Walon. She is happily married and has one teenage son named Dylan. Diana also collects Wizard of Oz memorabilia. Brandin has always had a passion for animals and decided to pursue formal education to further her career in veterinary medicine. She was accepted into the WCDDD/WSU Veterinary Technology Program in 2010 and graduated with her associates degree in Applied Science of Veterinary Tec hnology in 2012. After passing National and State Board exams, Brandin began her career in 2012 as a Licensed Veterinary Technician and became a part of the DFPC team in 1014. Brandin currently has 2 dogs and 1 cat. Leigh started working in the Veterinary field as a Kennel Attendant in 2016. She then attended Baker College to receive her Associate's Degree in Applied Science in 2018. After passing State and National board exams Leigh became licensed in the summer of 2018 and joined DFPC's nursing team in Aug. of 2018. Leigh enjoy's spending time with her family and friends including her do Cupid.